Lorraine Roy was born in the small French village of Pain-Court in Southwestern Ontario. Her interest in art and science lead to a B.Sc. in Ornamental Horticulture. Lorraine is noted for her painterly approach to textiles and threads. 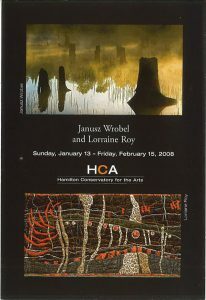 Her work has been exhibited in Canada, the US and abroad. Janusz Worbel born in 1951, Poland Janusz has a M. Sc. In Technology of Photographic Materials. He was a co-founding member of “Format” Art Group and Artistic Commissioner of Wroclaw Photographic Society. Since then he has owned and managed several photographic companies. He now lives in Dundas Ontario, where he shares Hillcrest Studio with his wife and professional textile artist, Lorraine Roy.